Buruli ulcer, the third largest mycobacterial disease, and tuberculosis, an ancient infectious disease which today claims more human life than any other bacterial infection are both caused by Mycobacteria. TB47, a new antibiotic candidate, inhibits these two mycobacteria by varying degrees. Here we report how the differences in the target of TB47 in them account for their differential susceptibilities to TB47. It is potentially highly potent against leprosy, the second largest mycobacterial disease. Mycobacteria usually grow very slowly, for example, it takes 3 to 6 weeks for Mycobacterium tuberculosis and ~3 months for Mycobacterium ulcerans to form a visible colony on agar containing enriched media. Traditional methods that depend on enumerating colony forming units (CFU) of bacteria to evaluate efficacy of a drug would significantly prolong the duration of preclinical studies required for development of antimycobacterial compounds/treatments. Autoluminescent reporter mycobacteria were constructed using the luxCDABE operon, which can emit light without the addition of exogenous substrates. Relative light units (RLU) counts correlated well with CFUs of mycobacteria. Use of this technology enabled rapid (3 seconds) and serial real-time monitoring of mycobacteria in the same samples in vitro and even in the same small live animals for evaluation of drug activity. Therefore, this approach can drastically reduce the time, effort, animals and resources necessary for assessments that require monitoring of mycobacteria growth. This method is highly efficient in active compound discovery both in vitro and in vivo. Existing treatments for mycobacterial infections are lengthy or losing effectiveness due to resistance/toxicity. New powerful drugs with new mechanisms of action could address the current need for novel regimens. TB47 is a new agent with activity against M. tuberculosis, the bacteria that causes tuberculosis. Using various in vitro,in macrophage and in vivo approaches, we found that TB47 is bacteriostatic against M. tuberculosis. We also assessed the activity of TB47 against M. ulcerans, the causative agent of Buruli Ulcer, using in vitro assays and an established mouse model mainly due to an international collaboration with Australia where Buruli Ulcer is still a problem. Buruli ulcer is a disease that manifests as skin ulcer resulting from destruction of skin and dermal tissue in response to a toxin secreted by M. ulcerans.In the mouse model of Buruli Ulcer, the footpad is used to assess pathology and response to treatment. When using TB47 to treat the autoluminescent M. ulcerans reporter strain infected mice, we were surprised to find that only several days, RLUs from the footpads reached to the background reading though only 3 mice used at the very beginning. Using this model, we further found that TB47 was bactericidal against M. ulcerans and prevented footpad swelling and pathology that are characteristic in untreated mice, as can be seen in the figure below. The swelling degrees of mouse footpads in untreated group, the WHO recommended rifampin 10 + streptomycin 150（injection）, TB47 0.8 , and 3.2 treated groups. COMX=TB47;dosage,mg/kg, given daily for 5 days. For uncovering mechanism of action of TB47, We spent more than one year to screen the spontaneous TB47-resistant M. tuberculosis mutants and found lots of colonies appeared on TB47 containing plates, but none of them was really resistant to TB47. M. ulcerans and Mycobacterium marinum are closely related in evolution. We selected TB47-resistant M. marinum mutants. However, we failed for > 10 times in the case of selection of TB47-resistant M. ulcerans mutants at the beginning. We postulated that it could be super sensitive to TB47. We then used as low as 0.02 μg/mL TB47 and succeeded in getting the resistant mutants. We identified mutations by sequencing the whole genomes of the mutants. A common mutation was a single nucleotide mutation resulting in an amino acid replacement in the gene that encodes for QrcB, a protein of the electron transport chain. We also hypothesize that CycAB protein complex confers protection from the poisoning effect of TB47 of the Qrc complex, as shown below. Two terminal oxidases in the electron transport chain of mycobacteria. QcrB in the cytochrome bc1:aa3 is the Achilles' Heel. We propose that QrcB is the Achilles’ Heel of mycobacteria that is targeted by TB47. Different species of mycobacteria exhibit varying levels of sensitivity to TB47. We hypothesize that molecular differences in the QrcB orthologs in different mycobacteria determine the level of inhibition by TB47. Likely equally important is how robust the CydAB complex is in each mycobacterium. For example, M. smegmatis genome encodes a robust CydAB complex and this potentially protects this mycobacteria from TB47. On the other hand, lack of active CydAB in M. ulcerans could potentially explain why TB47 is bactericidal against it. It is very interesting that no CydAB ortholog in M. leprae, the causative agent of leprosy, which indicates that TB47 may be supercidal to M. leprae. 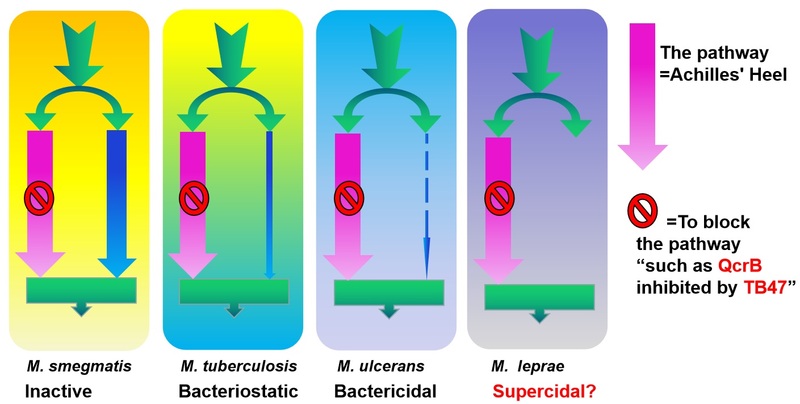 This indicates that screening/evaluation of anti-TB drugs using M. tuberculosis-based models are very important, as different mycobacteria may have different pathway activities (just like this study) and different enzymes. For example, the first-line anit-TB drug pyrazinamide is not active against most of mycobacteria including M. bovis which contains only one single nucleotide polymorphism in pncA gene compared to that from M. tuberculosis. However, if a drug/compound is active against one pathway of one mycobacterium, it may also affect the same pathway in another mycobacterium and so this agent may have additive/synergistic activity in combination. Diagram showing Achilles’ Heel and protectors of mycobacteria. If we can find an agent to disrupt protector(s) such as CydAB complex and combine it with TB47, it is possible that the combination will exhibit synergy in bactericidal activity against mycobacteria. This is a case supporting that proteins encoded by nonessential genes can be potential drug targets and novel drug discovery strategy based on synthetic lethality would greatly strengthen the preclinical development of drugs to treat mycobacterial infection. This post has been written by Tianyu Zhang, Yang Liu and Yamin Gao. Since 2002, my research has focused on microbiology, especially on actinomyces which includes streptomyces, mycobacteria etc. During my study in Johns Hopkins University Tuberculosis Research Center from 2005 to 2010, my research focused on the development and use of in vitro and animal models of mycobacterial infections for drug development under the supervision of Drs Nuermberger and Grosset, the late tuberculosis research Chairman in WHO. I also learned genetic approaches from Dr. Bishai during the same time. I constructed autoluminescent Mtb and M. ulcerans strains respectively, and found that use of these reporter strains have the potential to drastically reduce the time, effort, animals and resources in the evaluation of drug activity in vitro and the in vivo in live mice. I also refined a mouse model of latent tuberculosis (TB) to increase its predictive value and using it to demonstrate the promise of daily rifapentine-containing regimens for ultra-short treatment of latent TB infection and later TMC207(bedaquiline) -containing regimens for potential treatment of latent MDR-TB infection. National Institute of Allergy and Infectious Diseases (NIAID) released a piece of breaking through news on March 5th, 2018 to show that “One-Month Tuberculosis Prophylaxis as Effective as Nine-Month Regimen for People Living with HIV”. This clinical phase III study was based on my animal work. I was recruited to GIBH after completing my fellowship at Johns Hopkins University in September, 2010. My research focuses on physiology of Mtb with a focus on developing new drugs against TB. Tens of chemistry groups all over the world come to collaborate with my lab. We have had very good collaboration with all of them. One good example is that we have co-developed an antituberculosis drug candidate, TB47, and sold it to a company in Dec 2015. My lab was responsible for the biological part including the in vitro activity testing against drug-resistant clinical isolates and the in vivo study using virulent Mtb infected mouse model in ABSL-3 lab. 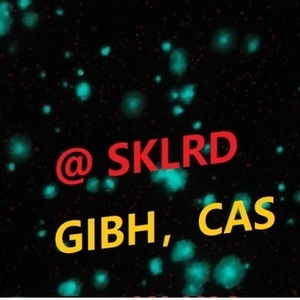 We also had cooperative project about antimycobacterial drug discovery with CSIRO (Australia) supported by CAS and CSIRO. We verified the Cys154Arg mutation in the ribosomal protein L3 can cause resistance to oxazolidinone. We found a potential new target of the first-line anti-TB drug pyrazinamide and explained from a new way about the persisters in 2017. We also found mutation ethAW21R Confers Co-resistance to Protionamide and Ethionamide in both M. bovis BCG and M. tuberculosis H37Rv. We have identified several gene mutations which can confer resistance to two new antituberculosis compounds discovered by us very recently using genome sequencing and genetic verification (unpublished). A compound COMX showed super powerful activity against M. ulcerans infection, which might shorten the duration from more than two months to ~five days. At least four series of compounds from four of our long-term partners showed antituberculosis activity in vivo very recently. We also created selectable marker-free M. abscess using a new system. All these are unpublished. I started my collaboration with Guangzhou Chest Hospital from early 2011. And then we established the Tuberculosis Lab of State Key Laboratory of Respiratory Disease in Feb 2012 and I am the co-director of the lab since then. In 2014, we reported the finding that 3’ end of rpsA might be added as the target of molecular detection of pyrazinamide susceptibility. These are typical results of my collaboration with clinical experts and doctors to solve some clinical problems. If you can not see the figures, it is possibly because your internet is too slow.